Fully restored to its original text as issued by Pope Leo XIII, May 18th 1890. Glory be to the Father, and to the Son, and to the Holy Spirit, as it was in the beginning, is now and ever shall be, world without end, Amen. LEADER: May Thy mercy, O' Lord, be upon us. ALL: Since we have hoped in Thee. LEADER: O' Lord, hear my prayer. ALL: And let my cry come unto Thee. LEADER: The Lord be with you, ALL: And with thy spirit. GOD the Father commands thee (+), GOD the Son commands thee (+), GOD the Holy Spirit commands thee (+). The Majesty of Christ, the Eternal Word of GOD made flesh, commands thee (+); He Who to save our race outdone through thy envy, "humbled himself, becoming obedient even unto death" (Phil 2:8). He who has built His Church on the firm rock and declared that the gates of hell shall never prevail against Her, because He will dwell with Her "all days even to the end of the world" (Mat 28:20). The Sacred Sign of the Cross commands thee (+), as does also the power of the Mysteries of the Christian Faith (+), the Glorious Mother of GOD, the Virgin Mary, commands thee (+); She who by Her humility and from the first moment of Her Immaculate Conception, crushed thy proud head. The faith of the Holy Apostles Peter and Paul and of the other Apostles command thee (+). The Blood of the Martyrs and the pious intercession of all the Saints command thee (+). Thus, cursed dragon and thee diabolical legion, we adjure thee by the Living GOD (+), by the True GOD (+), by the Holy GOD (+), by the GOD "who so loved the world that He gave up His Only Son, that every soul believing in Him might not perish but have life everlasting" (John 17:1-3); stop deceiving human creatures and pouring out to them the poison of eternal damnation; stop harming the Church and ensnaring her liberty. BEGONE, satan, inventor and master of all deceit, enemy of man's salvation. Give place to Christ in whom thou hast found none of your works; give place to the One, Holy, Catholic and Apostolic Church acquired by Christ at the price of His Blood. Stoop beneath the powerful Hand of GOD; tremble and flee when we invoke the Holy and terrible Name of Jesus, this Name which cause hell to tremble, this Name to which the Virtues, Powers and Dominations of Heaven are humbly submissive, this Name to which the Virtues, Powers and Dominations of Heaven are humbly submissive, this Name which the Cherubim and Seraphim praise unceasingly repeating: Holy, Holy, Holy is the Lord, the GOD of Armies! LEADER: May the Lord be with thee, ALL: And with thy spirit. LEADER: From the snares of the devil, ALL: Deliver us O' Lord. LEADER: Grant that Thy Church may serve Thee in secure liberty, ALL We beseech Thee, hear us. LEADER: Deign to crush down the enemies of the Holy Church, ALL: We beseech Thee, hear us. LEADER: Holy Water is sprinkled in the place where he may be. 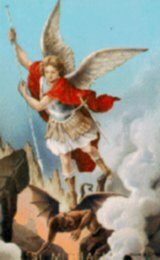 ALL: St. Michael the Archangel, defend us in the day of battle; be our safeguard against the wickedness and snares of the devil. May GOD rebuke him, we humbly pray and do thou, O' Prince of the Heavenly Host, by the Power of GOD, cast into hell satan and all the other evil spirits, who prowl throughout the world, seeking the ruin of souls, Amen. LEADER: Most Sacred Heart of Jesus, (Repeat 3 times) ALL: Have mercy on us. NOTE: (+) denotes that the Sign of the Cross is to be made: "In the Name of the Father and of the Son and of the Holy Spirit, Amen," between the prayer, as indicated.